Letters / Drop-dead Easy Tips! 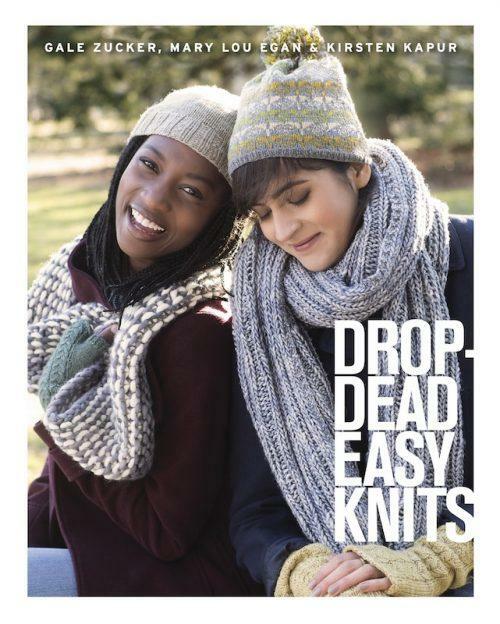 News you can use: really great tips from the trio who have created Drop-Dead Easy Knits, a juicy collection of gorgeous projects that goes on sale today. On the cover alone I see five things I want to make. Knitting tips galore. And a bonus: how to create a nice clean chin line in a photo? The answer is here, people. Watch and learn. One of the projects is a Kay Gardiner Special, a pattern called the Star-eyed Julep Throw. Kay, I hope you’ll tell us more about how you came up with this idea. You kept telling me you’d cooked up this mind-blowing log cabin pattern. It was like Bigfoot, this pattern—I never saw it, you kept talking about it, I tried to smile and not let you know I thought you’d lost your mind. Well, count me gobsmacked. It’s a beauty. This is so striking, I love it! Whoa, Charlotte, you’re up early!!! I LOVED the video! So many great tips, especially like the tip about putting a marker on the front side of your work and more markers on each increased row. Kay, you are the master at creating knitted blankets!! Very fun post! I wasn’t sure I got this. Place a marker every time you increase, and then count them? How is that different from just counting the stitches? What am I missing? I think the idea is to make a chain with the total number of increases (1 marker = 1 increase) and attach it lower on your work, then move a marker up to the actual row every time you do the increase. Love the humour in the vid! Talks right to my knitting self! Stunning use of log cabin! Watching x2 on my phone. So frustrating, but I could not read the signs effecively. Where’s the pattern for the blanket? I look forward to seeing all the patterns in this book. Video is a cute idea but handwritten signs are hard to read . That video was just adorable! Love it. Beautiful blanket, great tips and the book looks like a winner. I want to make everything you showed us. The bookstore is holding my copy! Oh Boy! The blanket looks So. Cool. Oh my gosh! Such a fun video, cute ladies, and Bea-U-Ti-Ful patterns!!! Gorgeous! I want this pattern. Please do not be beating yourself up for not finishing the Big Flower Jacket-where on earth did you get time to do the amazing throw?? I am in awe-once again- of the many projects you both FINISH! I only knit one block and it was more than a year ago so I’m not *that* productive! I will be making ghosts of my chins in photographs from now on. May choirs of angels sing those 3 knitters to the best price on Addi Lace needles in the known world. Loved the video – some good life tips! Ann, you should suggest to Kay that she just wrap that beautiful blanket around her shoulders and wear it to Rhinebeck. No need to fret over finishing that big ol’ flower jacket. Great tips – learned a few new things, but most of all it was done with such a wonderful flare. It made LOL. Really enjoyed it. What a lovely video – the signs are great! I especially enjoyed the convincing nods and smiles 🙂 Thank you for all these wonderful tips, knitters! And Kay, wow. Way to keep a secret surprise! That blanket is a stunner. I am saying this in a Captain Hastings voice. Love the video! And the patterns of course, but the video was the perfect entertainment to go with my first cup of coffee this morning. Wow…wow, wow. Everything. Very important tips in that video. Checked out the book on Ravalry…29 really good-looking patterns. Must have. Ordered! Ann, silly, you designed it too! At least according to Ravelry…..
What a cute video! Despite not needing any more knitting books (or yarn), I’m going to have to buy this one! Okay, that’s one of the most charming book trailer videos I’ll ever see. Only the ones for Teeny Tiny MochiMochi are in its league, I think. Of course, my tastes run more toward the realm of Completely Insanely Complicated Knits most of the time. Ridiculous lace repeats (in length and complexity), mixed Fair Isle and intarsia in the round at the same time, 32-row cable repeats….bring ’em on. Then again, there always are two or three pairs of vanilla socks on the needles, too. Great tips on the video and fun to now put faces to the names – so cute with the head nodding. I had not heard of the black and white photo for contrast trick. My daughter taught me the neck trick -she calls it “pigeon neck”. 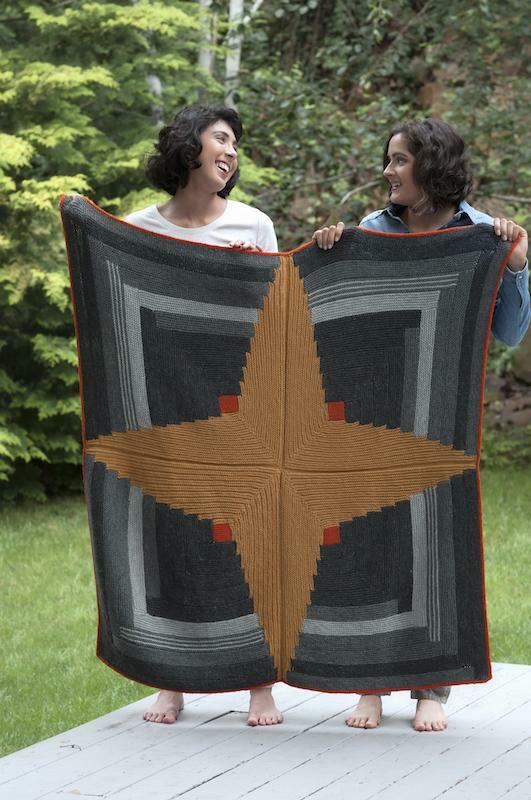 Your star-eyed julep throw is a standout – exceptionally clever and quilt-like. I like several of the patterns, so has gone in my Amazon wish list. The book looks great! I definitely want to dive in! I also appreciate the “tips” video. All those knitter-designer-writers are so cute, and I used the “clean chin line” photograph tip the very same day! (Question: When did my double chin turn into jowls?) The only quibble I have is with the “yarn chicken” tip. It may be because I am a loose knitter, but I actually need FOUR times the length of whatever I have left to knit, not three. Ask me how I learned this.